It’s been a while, but I’m back watching Hitchcock and writing about it! My recent move has put me right in the middle of a rather huge library system that has an excellent selection of Hitchcock films. I’ve nearly depleted my own collection, and have definitely seen everything Netflix and Amazon Prime have to offer, so it was becoming difficult for me to find films to watch without buying them. The first two Hitchcock’s I checked out of the Carnegie Library were Saboteur, starring Robert Cummings (who also appears in Hitchcock’s Dial M for Murder) and Priscilla Lane, and Stage Fright (which I’ll get to later). It’s so nice to have so many to pick from again! 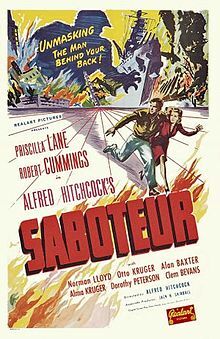 Saboteur is your classic Hitchcock innocent man accused of a crime he didn’t commit and forced to go on the run with a beautiful woman plot (see The 39 Steps, Young and Innocent, North by Northwest, etc, etc). What is interesting about the plot of this film is that it is a topic that is still very relevant today. Hitchcock spent a lot of time exploring sabotage, espionage, shadow organizations, and terrorism (both domestic and abroad). These things have been fresh on our minds for the past decade and a half.